**** Thanks to the comments below from Susie and Mark – I’ve updated the code for the echo date and URL link. Of course change the code in red to your own details of your own website. After that you can refresh your Joomla 2.5 website and you will see the footer changed. Thanks a lot! This greatly helps! No problem, glad the post helped you. And here I go looking for the footer.php… thanks for this tut. May I mention that if anyone got problem with the code, I had to change the (‘Y’) to (“Y”) to get it to work without a listing of errors. However, I was working on my latest WAMP localhost…??? Thanks for the comments, will definitely update my post with your suggestion. Ditto on the ‘Y’ changed to “Y” on a live site otherwise it displays the single quotation mark. This may be more of a PHP config issue (I recall running into this type of problem some time back but don’t recall the details). Analogously, I had to use single quotation marks instead of double to the href address to prevent to prevent Joomla 2.5 from adding http://www.sitename.com/index.php in front of the link address I was trying to use (so in this case on my Joomla site, href=’http://www.cmsmind.com/’… works, whereas href=”http://www.cmsmind.com/” … generates the error). Thanks for the explanation – really appreciate it. I will update my post accordingly. I had to remove the single quotes around the href link, and leave no quotes to get the link to work. Maybe it’s a PHP version issue dependant on the web host? Great site, new to Joomla so surfing around looking for tips and found you. Thank you. Thanks for your comments and appreciate your feedback. Yah perhaps the PHP version, everyone is running something different. Valeu muito Obrigado! Já trabalho com informática a mais de 10 anos mas na área de manutenção e redes, agora estou me aventurando em sites. Sem problemas. Networking e manutenção é o material duro, criação de websites é a parte fácil. Você vai buscá-lo rápido. No problem. Glad my post helped. Thank you for a great tutorial, really helps. No problem. Thanks for adding my site to your favourites. thanks, the above trick I’ve done but not successful. why how about a template that is already in the manipulation by the developers ? the first step what to do ? Excellent work Elaine – I know I’ll get slated for this but it’s particularly great that the JOOMLA learning experience is coming from a truly competent woman (I guess that there are a few out there who share my views but in these days of political correctness haven’t had the courage to say so). Go girl! I’m a reluctant JOOMLA addict with zero skills but 99% passion and I love what you’re doing. New for Joomla and just found you web site, very use full for new starter. Just one simple question, How can I move the footer text “Powered by Joomla” to at the center of left. I have add the following code but it does not work. Thanks this was just what I needed! It only works for me (joomla 2.5.4) with out double or single “/’. That’s great. Thanks for sharing your solution. All the best. I used this article to edit the footer of my website. Thanks a lot for such a beautiful way of explanation. These steps helped me to remove the footer text “powered by Joomla”. Thanks for the lesson. it helped me. Wow Nigeria, that’s cool. No problem. I’m glad my post helped you! Your style is very unique in comparison to other people I’ve read stuff from. Many thanks for posting when you have the opportunity, Guess I will just book mark this page. here i will show you how to remove the footer text in your premium joomla 2.5 template. 1- go to your main directory in your web server root. 7-open up default.php with any text editor scroll down to bottom and you will see the footer text just remove it or change it to your required text. I could remove the text on 2 out of 5 pages, but it shows on three pages ???? How can it be erased from some pages but not all?? How does one remove words Contribute!, Books and Shop!” at the bottom of Joomla 2.5 banners? Take a look at this post here and let me know if you still can’t figure it out. We would like to remove the “Joomla 2.5 Templates designed by Joomla Web Design” in the template Joomla Business12 from . Can you help us please? 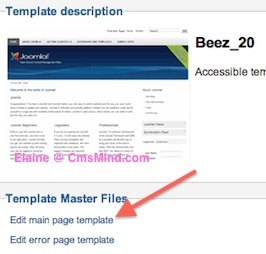 Go to your your Joomla 2.5 root directory, then open ‘templates’, here you will see a folder written ‘Block’. Open it and you see a file ‘ footer.php’. Then you can edit it from here. I am asking because I have the exact same problem with the exact same template . I followed the direction Eddy Nyella provided and it worked. The only difference was I found “blocks” on business root and not Joomla 2.5 root. It could different for others. I have removed the footer from my website however it only works on the home page – the main content on the other pages seem to stop short. I have included the site for you to see the problem. Can you show me what you mean? I went to your site but cannot see footers on any of your pages. I have removed the footer from my website. I wasn’t looking proper to the code and almost crashed the whole layout, but I succeed changing the footer. The template of my website looks very professional after changing the footer. Thank for tutorial! This tutorial is so easy to follow, even for a newbie like me! I have hit a snag though – on Design Canvas template I cannot find the specified code. Where else would it be hiding? Couldn’t stop myself from thanking you, for these easy to follow and very helpful tutorials. I’m developing my first site in Joomla and should credit many learning to you. I did your tip and work very well in my website. As somebody who builds my own web work, I cannot tell you how frustrating it can be to try and change these things! Thanks for the pointers! This will save me hours. Alaine your really awesome, Thanks so much for your tips. They are really helpful.